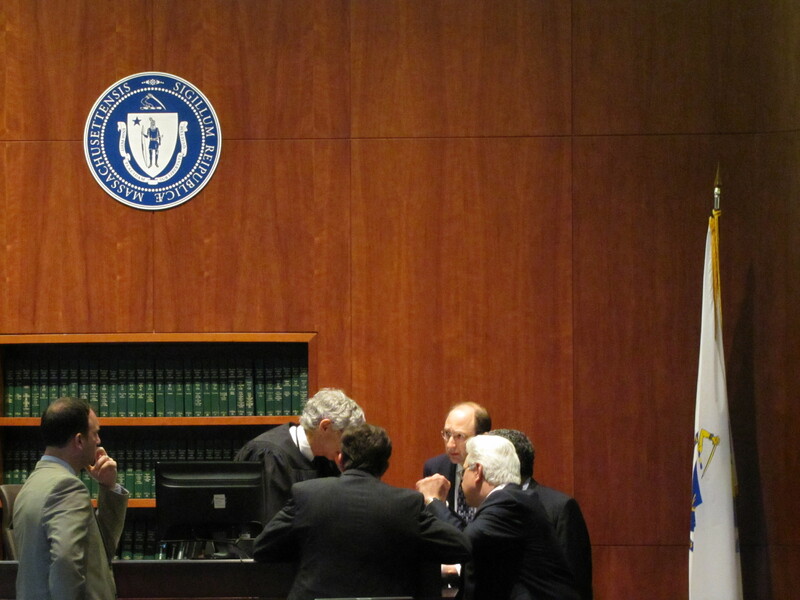 Lawyers consult with Justice Raymond J. Brassard during a civil trial at Plymouth County Superior Court. PLYMOUTH, Mass.— The final witness called by defense lawyers in the Bouchard 120 oil spill trial testified Tuesday that damages sought by eight Mattapoisett property owners total as much as $1,280— far less than the $245,300 figure cited by the plaintiffs’ real estate appraiser. William H. Desvousges, a natural resource economist, told jurors Bouchard paid him to analyze damage estimates calculated by real estate appraiser Jonathan H. Avery, who was hired by the plaintiff’s attorneys. Last week, Avery testified that his analysis showed the eight plaintiffs lost between $5,000 to $60,000 per property in potential rental value due to contamination of their beaches from the April 27, 2003 oil spill. The eight plaintiffs are among 1,100 Mattapoisett property owners who filed a class-action lawsuit against Bouchard in September 2004. The class is seeking damages for the lost use and enjoyment of their private beaches, which were polluted in the oil spill. Desvousges challenged Avery’s methodology for calculating damages, saying his approach— that property owners lost a “beach premium,” worth 30 percent of their potential annual rental value, for as many years as the state considered their beach to be contaminated — was based on speculation. “He simply assumed his conclusion, that this entire beach premium was lost as a result of the spill,” Desvousges said. As an economist, Desvousges said he took a different approach to calculating potential damages from the oil spill. First, he examined whether property owners had rented their properties and if they had, whether there was a change in rent after the oil spill. Next, he considered “objective evidence” related to oil contamination at beaches, the pace and scope of the cleanup, weather conditions and people’s use of the beach. Finally, he researched whether substitute beaches were available. He concluded that five of the eight property owners incurred zero economic damage. For the other three, his analysis showed some damages. He calculated $30 in damages for cleaning supplies bought by Ronald and Daniele Bick, who own 37 Silver Shell Ave. near Crescent Beach. For Bradford Chase’s property at 15 Seamarsh Way, he said damages ranged between $0 and $250, the cost of a membership at Mattapoisett YMCA, which he considered a substitute beach. “Pepper flecks” of oil at Leisure Shores beach contributed to damages of between $250 to $1,000 for Francis Haggerty’s property at 126 Brandt Island Rd, he said. During cross examination, plaintiffs’ attorney Max D. Stern questioned Desvousges’ analysis, saying he excluded certain factors such as whether there was subsurface oil at beaches or whether the smell of oil affected people’s enjoyment of their beaches. Stern also told the the economist that the Mattapoisett YMCA beach is closed to the public when summer camp is in session. The defense rested after Desvousges’ testimony. Judge Raymond J. Brassard dismissed the jury for the remainder of the afternoon. The trial continues Wednesday morning with closing arguments from the lawyers.